It was a wonderful end to the meal Sue. The cake was deliciously moist, I doubt it was really healthy...but adding a bit of fruit and veg certainly gives that illusion!! It looks delicious. If only I could get my beetroot to germinate. My beetroot doesn't seem to be doing too well this year, I germinated it in the greenhouse but since planting it doesn't seem to have grown at all. A woman after my own heart Ann!! 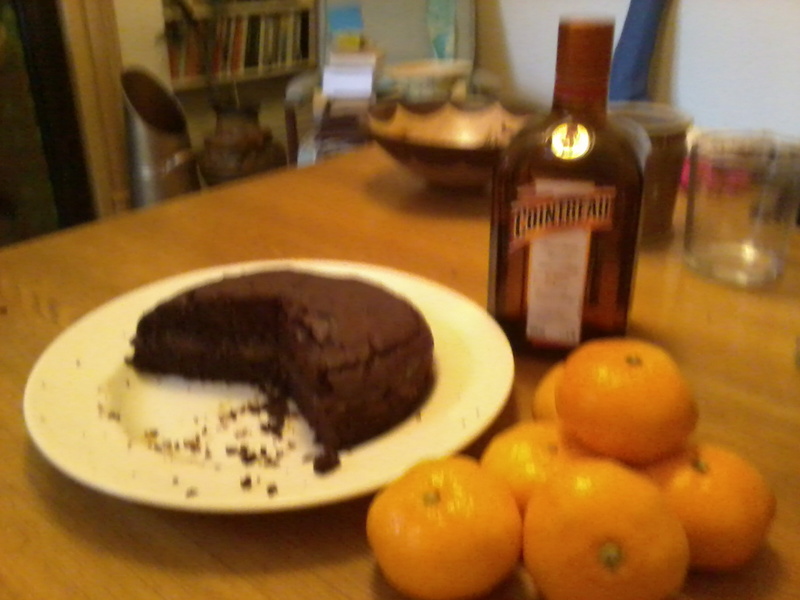 Does it taste like alcohol a lot with the cointreau on top? Otherwise, looks divine! It doesn't taste like alcohol ALOT but you can certainly taste it...but you don't have to add it, we were just friends being particularly indulgent...it's great without it to!! Dear Tanya, What a delicious chocolate cake. I think the whole cake is healthy. Chocolate is supposed to be good for you and I love chocolate. Your gardens look wonderful. I have a small garden to tend. I did some planting this year. I planted a few veggies and some herbs. I am looking forward to the results. I think it is healthy too. I don't believe in diets or this nonsense that stuff is bad for you, everything is good for you in moderation and it's good to indulge sometimes...diets are over-rated and I have never been on one!! Good luck with your harvest this year...maybe you can use some in your cooking. I enjoy visiting your site...thanks for all the wonderful recipes you share. I have never even heard of beetroot! but this cake definitely looks yummy!! thanks..I love to learn about something new. I can't believe you've never heard of beetroot. It is a wonderful root veg. Most are a deep purple colour and they are good baked or pickled, you can also eat it raw, juice it, add it to cakes and savoury dishes...be careful though...if a lot is eaten/drank at once it changes the colour of your urine which can cause people to panic a little if they don't know. It has quite a strong flavour which is toned down when added to cooking so if you tried it on it's own and didn't like it don't be put off adding it to a cake. I think this is my kind of food. I bet everyone is thinking that though. There are the people that don't eat beetroot so wouldn't want to give this a try Ratty...lol. I simply must try this recipe!